Specially designed EPDM O-Ring making >B< Press Inox suitable for HVAC, hot & cold drinking water applications. Available in sizes 15 - 54mm. 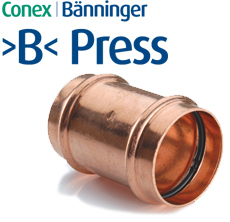 >B< Press Inox tube system available using precision steel tubes according to EN 10312. Designed for hydrostatic water pressure up to 16 bar. Designed for temperature ranges of -35°C to 110°C. Fully tested and approved by DVGW. 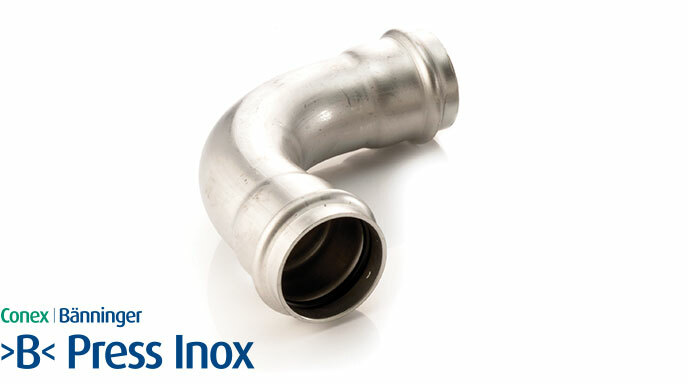 Full system available with approved >B< Inox tubes. System guarantee is 10 years. Fittings guarantee is 5 years when used with tubes in accordance with EN 10312. Series 1 and Series 2. Thread fittings ISO7 Internal Rp series parallel and external R series taper.